I recently found this recipe for Clover Cookies on Martha Stewart. 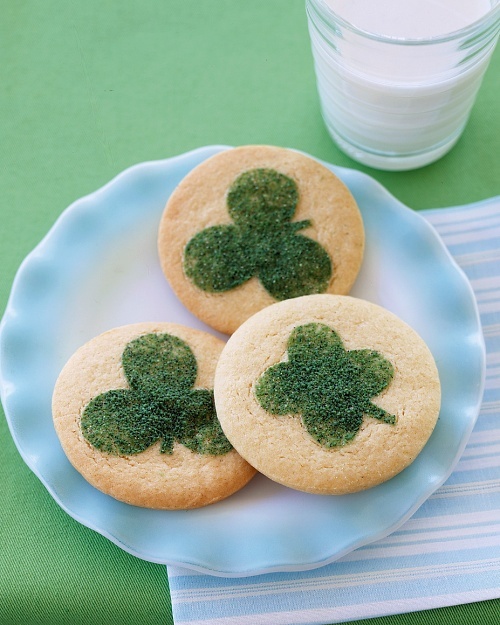 It's such an easy recipe, with a simple tweak on sugar cookies, fitting for St. Patrick's Day! The following recipe yields 50. Reduce speed to low. Add flour mixture in two additions, mixing until well combined. Mix in vanilla. Divide dough in half, and cover with plastic wrap; refrigerate 30 minutes. Preheat oven to 350 degrees. Roll out 1 piece of dough on a lightly floured work surface 1/8 inch thick. With a 3-inch cookie cutter, cut out 25 rounds. Working with 1 round at a time, place clover stencil on top; sprinkle surface with sanding sugar. Arrange rounds on parchment- or nonstick baking mat-lined baking sheets. Refrigerate until firm, about 15 minutes, or until ready to bake. Repeat process with remaining dough. Bake, one sheet at a time, until edges just start to brown, 10 to 12 minutes. Let cool completely on sheets on wire racks. Store cookies in an airtight container for up to 5 days. So cute! Perfect for a St. Patty's Day celebration. so cute and should be yummy! Aww, they look so cute! Yum, those look like the cutest cookies ever! Sweet! Thanks for sharing the recipe! These are so adorable and seem quite simple to make! Many thanks for stopping by, your comments and opinions mean a lot to me. Those look so good.Thanks for stopping by and have a great St. Patrick's Day. These are absolutely adorable and so festive!